The title of this study is not an exact translation of the second half of Romans 11:36, but I have selected it because it is the way the Protestant Reformers expressed what this verse is about and because the words, though in Latin, are well known. Soli Deo Gloria means “To God alone be the glory.” Soli Deo—“to God alone.” Gloria—“the glory.” These words stand virtually as a motto of the Reformation. The Reformers loved the word solus (“alone”). They wrote about sola Scriptura, which means “Scripture alone.” Their concern in using this phrase was with authority, and what they meant to say by it was that the Bible alone is our ultimate authority—not the pope, not the church, not the traditions of the church or church councils, still less personal intimations or subjective feelings, but Scripture only. These other sources of authority are sometimes useful and may at times have a place, but Scripture is ultimate. Therefore, if any of these other authorities differ from Scripture, they are to be judged by the Bible and rejected, rather than the other way around. The Reformers also talked about sola fide, meaning “faith alone.” At this point they were concerned with the purity of the gospel, wanting to say that the believer is justified by God through faith entirely apart from any works he or she may have done or might do. Justification by faith alone became the chief doctrine of the Reformation. The Reformers also spoke of sola gratia, which means “grace alone.” Here they wanted to insist on the truth that sinners have no claim upon God, that God owes them nothing but punishment for their sins, and that, if he saves them in spite of their sins, which he does in the case of the elect, it is only because it pleases him to do so. They taught that salvation is by grace only. There is a sense in which each of these phrases is contained in the great Latin motto Soli Deo Gloria. In Romans 11:36, it follows the words “for from him and through him and to him are all things,” and it is because this is so, because all things really are “from him and through him and to him,” that we say, “To God alone be the glory.” Do we think about the Scripture? If it is from God, it has come to us through God’s agency and it will endure forever to God’s glory. Justification by faith? It is from God, through God, and to God’s glory. Grace? Grace, too, has its source in God, comes to us through the work of the Son of God, and is to God’s glory. Many Christian organizations have taken these words as their motto or even as their name. I know of at least one publishing company today that is called Soli Deo Gloria. It is also an appropriate theme with which to end these studies of the third main (and last doctrinal) section of Paul’s letter to the Romans. Indeed, what greater theme could there be? For what is true of all things—that they are “from” God, “through” God, and “to” God—is true also of glory. Glory was God’s in the beginning, is God’s now, and shall be God’s forever. So we sing in what is called the Gloria Patri. At the beginning of this series—in volume 1, chapter 2—177 studies ago, I mentioned a revival that took place in Geneva, Switzerland, under the leadership of a remarkable Scotsman named Robert Haldane (1764–1842). He was one of two brothers who were members of the Scottish aristocracy in the late eighteenth and early-nineteenth centuries. His brother, James Haldane (1768–1851), was a captain with the British East India Company. Robert was the owner of Gleneerie and other estates in Perthshire. When he was converted in the decade before 1800, Robert sold a major part of his lands and applied the proceeds to advancing the cause of Jesus Christ in Europe. James became an evangelist and later an influential pastor in Edinburgh, where he served for fifty-two years. In the year 1815, Robert Haldane visited Geneva. One day when he was in a park reading his Bible, he got into a discussion with some young men who turned out to be theology students. They had not the faintest understanding of the gospel, so Haldane invited them to come to his rooms twice a week for Bible study. They studied Romans, and the result of those studies was the great Exposition of Romans by Haldane from which I so often quote. All those students were converted and in time became leaders in church circles throughout Europe. One was Merle d’Aubigné, who became famous for his classic History of the Reformation in the Sixteenth Century. We know the first part of it as The Life and Times of Martin Luther. Another of these men was Louis Gaussen, author of Theopneustia, a book on the inspiration of the Scriptures. Others were Frédéric Monod, the chief architect and founder of the Free Churches in France; Bonifas, who became an important theologian; and César Malan, another distinguished leader. These men were so influential that the work of which they became a part was known as Haldane’s Revival. What was it that got through to these young men, lifting them out of the deadly liberalism of their day and transforming them into the powerful force they became? The answer is: the theme and wording of the very verses we have been studying, Romans 11:33–36. In other words, a proper understanding of God’s sovereignty. There was nothing brought under the consideration of the students of divinity who attended me at Geneva which appeared to contribute so effectually to overthrow their false system of religion, founded on philosophy and vain deceit, as the sublime view of the majesty of God presented in the four concluding verses of this part of the epistle: Of him, and through him, and to him, are all things. Here God is described as his own last end in everything that he does. Judging of God as such an one as themselves, they were at first startled at the idea that he must love himself supremely, infinitely more than the whole universe, and consequently must prefer his own glory to everything besides. But when they were reminded that God in reality is infinitely more amiable and more valuable than the whole creation and that consequently, if he views things as they really are, he must regard himself as infinitely worthy of being more valued and loved, they saw that this truth was incontrovertible. Their attention was at the same time directed to numerous passages of Scripture, which assert that the manifestation of the glory of God is the great end of creation, that he has himself chiefly in view in all his works and dispensations, and that it is a purpose in which he requires that all his intelligent creatures should acquiesce, and seek and promote it as their first and paramount duty. Romans 11:36 is the first doxology in the letter. But it is followed by another at the end, which is like it, though more complete: “To the only wise God be glory forever through Jesus Christ! Amen” (Rom. 16:27). It is significant that both doxologies speak of the glory of God, and that forever. Here are two questions to help us understand them. 1. Who is to be glorified? 2. Why should God be glorified? The answer is that “from him and through him and to him are all things,” particularly the work of salvation. Why is man saved? It is not because of anything in men and women themselves but because of God’s grace. It is because God has elected us to it. God has predestinated his elect people to salvation from before the foundation of the world. How is man saved? The answer is by the redeeming work of the Lord Jesus, the very Son of God. We could not save ourselves, but God saved us through the vicarious, atoning death of Jesus Christ. By what power are we brought to faith in Jesus? The answer is by the power of the Holy Spirit through what theologians call effectual calling. God’s call quickens us to new life. How can we become holy? Holiness is not something that originates in us, is achieved by us, or is sustained by us. It is due to God’s joining us to Jesus so that we have become different persons than we were before he did it. We have died to sin and been made alive to righteousness. Now there is no direction for us to go in the Christian life but forward. Where are we headed? Answer: to heaven, because Jesus is preparing a place in heaven for us. How can we be sure of arriving there? It is because God, who began the work of our salvation, will continue it until we do. God never begins a work that he does not eventually bring to a happy and complete conclusion. Such is the appropriate conclusion of the doctrinal portion of this wonderful epistle, in which more fully and clearly than in any other portion of the Word of God, the plan of salvation is presented and defended. Here are the doctrines of grace, doctrines on which the pious in all ages and nations have rested their hopes of heaven, though they may have had comparatively obscure intimations of their nature. The leading principle of all is that God is the source of all good, that in fallen man there is neither merit nor ability, that salvation, consequently, is all of grace, as well satisfaction as pardon, as well election as eternal glory. For of him, and through him, and to him, are all things; to whom be glory forever. Amen. What of the objections? What of those who object to the many imagined bad results of such God-directed teaching? Won’t people become immoral, since salvation, by this theory, is by grace rather than by works? Won’t they lose the power of making choices and abandon all sense of responsibility before God and other people? Won’t people cease to work for worthwhile goals and quit all useful activity? Isn’t a philosophy that tries to glorify God in all things a catastrophe? A number of years ago, Roger R. Nicole, professor of systematic theology at Gordon-Conwell Divinity School in South Hamilton, Massachusetts, and now at Reformed Theological Seminary in Orlando, Florida, answered such objections in a classic address for the Philadelphia Conference on Reformed Theology (1976), basing his words on an earlier remarkable address by Emile Doumergue, a pastor who for many years was dean of an evangelical seminary in southern France. Nicole’s address was likewise titled “Soli Deo Gloria.” The quotations below are from his answers to three important questions. 1. Doesn’t belief in the sovereignty of God encourage evil by setting people free from restraints? Doesn’t it make morality impossible? “I suppose one could proceed to discuss this in a theological manner—to examine arguments, consider objections, and line up points in an orderly disposition. I would like, however, instead of going into a theological discussion, to challenge you in terms of an historical consideration. In the Reformation, there was a group of men who made precisely these assertions. Over against the prevailing current, they said that man is radically corrupt and is therefore totally unable by himself to please God. He is incapable of gathering any merits, let alone merit for others. But did these assertions damage morality? Were these people a group of scoundrels who satisfied their own sinful cravings under the pretense of giving glory to God? One does not need to be very versed in church history to know that this was not so. There were at that time thefts, murders, unjust wars. Even within the church there was a heinous and shameful trafficking of sacred positions. “These people, who believed that man is corrupt and that only God can help him, came forward like a breath of fresh air. They brought in a new recognition of the rights of God and of his claim upon the lives of men. They brought in new chastity, new honesty, new unselfishness, new humbleness, and a new concern for others. “Honest like the Huguenots,” they used to say. … Immorality was not promoted; it was checked by the recognition of the sovereignty of God. 2. Doesn’t belief in the sovereignty of God eliminate man’s sense of responsibility and destroy human freedom? Doesn’t it destroy potential? “Again, rather than going into the arguments of the matter, let us merely examine what happened in the sixteenth century when the sovereignty of God was asserted. Did the people involved allow themselves to be robbed of all initiative? Were they reduced to slavery under the power of God? Not at all! On the contrary, they were keenly aware of their responsibility. They had the sense that for everything they were doing, saying and thinking they were accountable to God. They lived their lives in the presence of God, and in the process they were pioneers in establishing and safe-guarding precious liberties—liberty of speech, religion and expression—all of which are at the foundation of the liberties we cherish in the democratic world. “Far from eclipsing their sense of freedom, the true proclamation of the sovereignty of God moved them toward the recognition and expression of all kinds of human freedoms which God has himself provided for those whom he has created and redeemed. 3. Doesn’t commitment to God’s sovereignty undercut strenuous human activity? Doesn’t it make people passive? “We may make an appeal to history. What did these people—Calvin, Farel, Knox, Luther—what did they do? Were they people who reclined on a soft couch, saying, ‘If God is pleased to do something in Geneva, let him do it. I will not get in his way’? Or, ‘If God wants to have some theses nailed to the door of the chapel of Wittenberg Castle, let him take the hammer. I will not interfere’? You know very well that this is not so. These were not people lax in activity. They were not lazy. Calvin may be accused of many things, but one thing he has seldom been accused of is laziness. No, when the sovereignty of God is recognized, meaningfulness comes to human activity. Then, instead of seeing our efforts as the puny movements of insignificant people unable to resist the enormous momentum of a universe so much larger than ourselves, we see our activity in the perspective of a sovereign plan in which even small and insignificant details may be very important. Far from undermining activity, the doctrine of the sovereignty of God has been a strong incentive for labor, devotion, evangelism and missions. “In the sixteenth century … the church had succumbed to deep corruption. It was corrupt ‘in its head and members.’ In many ways it was a cesspool of iniquity. People did not know how to remedy the situation. They tried councils, internal purges, monastic orders. None of these things seemed to work. But God again raised up to his glory men who proclaimed the truth of his sovereignty, the truth of God’s grace. In proclaiming this truth they brought a multitude of the children of God into a new sense of their dependence upon and relationship to Christ. In proclaiming this truth they benefited even the very people who opposed them in the tradition of the church. They are small, these men of the Reformation. They had little money, little power and little influence. One was a portly little monk in Germany. Another was a frail little professor in Geneva. A third was a ruddy but lowly little man in Scotland. What could they do? In themselves, nothing. But by the power of God they shook the world. Radically corrupted, but sovereignly purified! Radically enslaved, but sovereignly emancipated! Radically unable, but sovereignly empowered! SOURCE: James Montgomery Boice. Expositions on Romans. Volume 3. 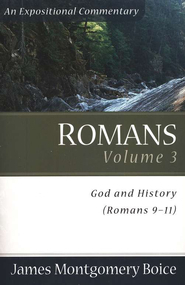 God and History (Romans 9-11). Chapter 179, “Soli Deo Gloria” based on Romans 11:36. Tags: God's Glory, God's Sovereignty, James Montgomery Boice, Robert Haldane, Sermon on Romans 11:36, Soli Deo Gloria, Why should God be glorified?